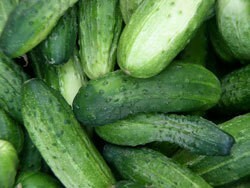 I make cucumber soap and planned to grow my own cucs for my projects. Some how I made a major mistake and also planted more cucs instead of melons so now I have double the cucs that I needed! When making soap, I puree the cucumbers so if I freeze some of the puree do you think the mush will have the same color, consistency and smell when I thaw it? How do you make cucumber soap? I am running out of ideas for my cucumbers. This could be a great solution! Why do you use oil? What is its purpose?